Making arrangements for children during separation and divorce is always emotional, and may be conflictual for all family members. The legal principle of ‘no order’ for child contact arrangements puts the onus on parents to decide on a workable parenting schedule. Children can adapt well to having two homes in those cases where their parents are co-operative and positive about the situation, and where children feel able to have their thoughts and feelings heard in decisions being made about their lives. Children often ‘spare’ parents their more difficult feelings. Where they are able to share their feelings about their divided lives with caring parents, they feel less burdened and happier. I specialise in helping parents negotiate the best arrangements for their children. As well as working with parents, I am also qualified to have individual meetings with the children as part of helping parents to find the best solution for their family. With parental permission, I will arrange to see your children to ensure their voices are part of this process, and that parental decisions made about the children take account of the views of the children. 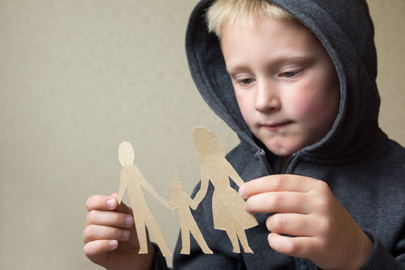 Family Mediation can also be very helpful years after divorce. Child arrangements that were negotiated some time ago without a review clause, or were established without a written agreement, become unworkable for either one of the parents, or the children. Time moves on. Children grow older and begin to want to have more control over their own lives, family structures change, new parental partners and new families become part of the children’s changing world, parents need or choose to move house. In Family Mediation, discussing how to make changes to existing arrangements can be done in a calm, impartial environment, with parents and children all able to have a voice.